Have a great week, Barbara, and enjoy your finds! Sounds like you and your friends had a great weekend, what fun. Love the red dishes, what a great find. What a great way to spend the weekend, with the girls. I so want some of the red transferware! The only color I haven't found - red. Great finds, love the Coca Cola carrier! Enjoy your day! that pitcher is so cute with the double sided pour spouts..lefty or righty can benefit from it. I could spend hours in antique shops. We have one that is so huge, it has a 4 star cafe in it as well that serves some real top notch food. Plus there is a bed in there that is custom made for a mansion,(would have to be, it is 10 1/2 foot tall) and is on sale for 12,000 dollars and the bedding is not included! I was curious about that, since nothing else will ever fit it right out of the store. The bed spread is blue ,gold,creme silk and brocade. There is so much memorbilia from our state in there as well..quite the place to see. It is in an old cotton mill warehouse where the trains would stop to be filled with their wares. No trains run there anymore, but it is a huge antique mall. Sounds like you had a fabulous weekend Barbara!! Great finds! Wow! Sounds like a wonderful place to prowl around. I love those pretty dishes and the coke box! Visiting from Knick of Time. What great finds you made! Love all the cheerful red. Thanks for sharing! 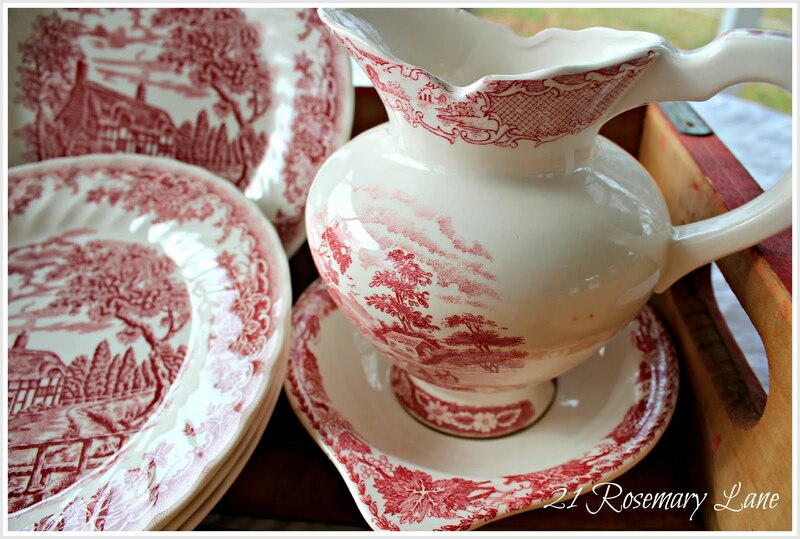 I swoon, I collect red transferware! Great job. I recently found a pitcher - almost identical to yours, only in blue! I just love it. Also, your price on that crate was AMAZING! Good for you! I live about 45 minutes away from there--definitely need to check it out! 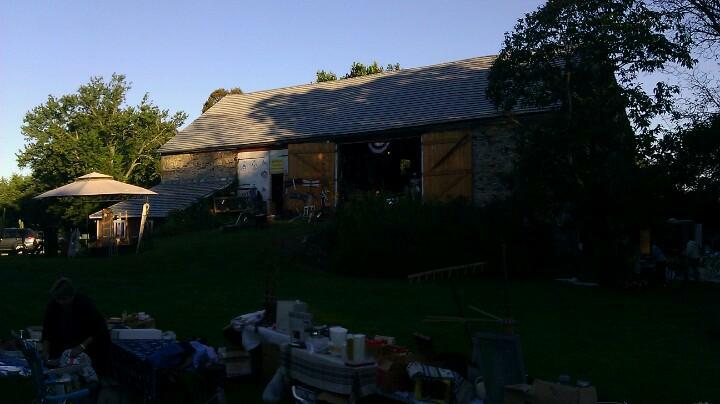 If you are back in Berks county in the summer you have to check out Leesport Farmers market. They have flea markets every Wednesday and the 1st & 3rd Sunday of the month. I have found some pretty amazing things there. I usually go to the Sunday markets as there are less dealers there and the prices are very reasonable. What a fun weekend you had and such great finds. Hi Barbara! You really scored big. Love your finds. I was just in Easton, PA with my oldest last week. She had a modeling job at Lafayette College and while she was there I did some shopping downtown. What a beautiful place! We should get together sometime since we are not that far away from eachother. Great finds. 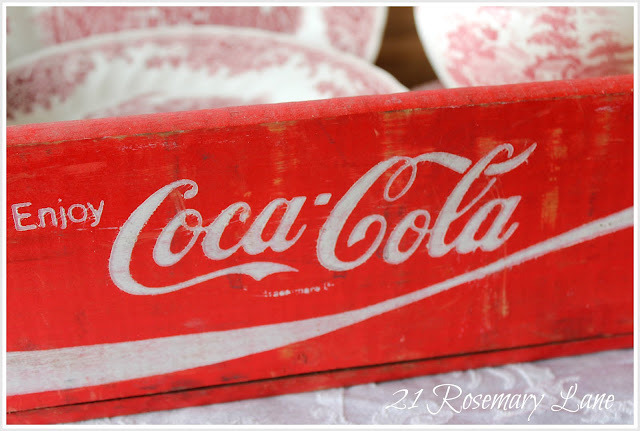 I love the red and white items you found. They are amazing. What fabulous finds. Congratulations on your good fortune! Beautiful finds! Sounds like you guys had such fun! I need a weekend like that too! Love the red transferware, really great prices on it! Lovely finds. I'm your newest follower and I found you through French Country Cottage. 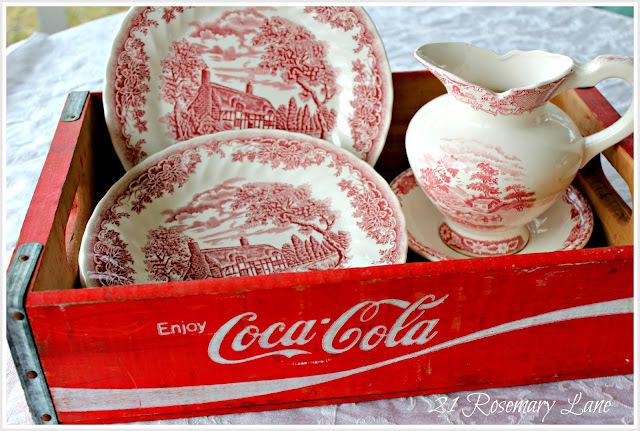 Love the transferware in red. I've been looking for some in deep brown or black for a project but haven't come across some. Maybe I need to travel to neighboring PA to find what I want. I just found you through Savvy Southern Style. I'm your latest follower. Hoping you'll follow back. That pitcher was a great find, Barbara! I got those same plates from CTS. I couldn't believe it when I saw them there. I never did look to see if they had any mugs to go with it, so next time I'm down that way I'll have to check. The thrift stores here don't seem to have much in transferware, although the antique marts have some. Barbara, do you have a piece of tissue? I need to wipe the drool off my face! 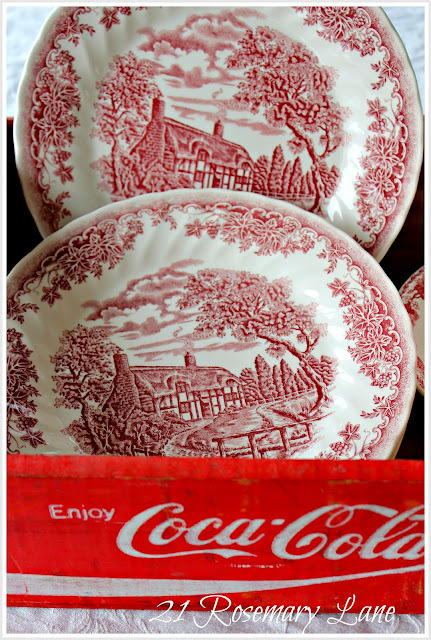 I so would love to find transferware like that. You scored good my friend! I will be featuring you at Share Your Cup this week. Love all the red - such beautiful finds! What great finds! I'm slowly becoming obsessed with red! The colors is bringing such warmth to my kitchen. Oh my goodness! I couldn't believe my eyes when I saw that pitcher!! I have the exact same one! It was a gift from my grandparents back in the early 70's! I got red and my sister got blue! My grandparents always brought us a gift when they returned from their winter in Florida! I still have mine on display in my bathroom! I hope you enjoy yours as much as I have mine!! I have the pitcher in Texas too :^) I love it and often use it to hold flowers in the guest room when folks are coming to visit. 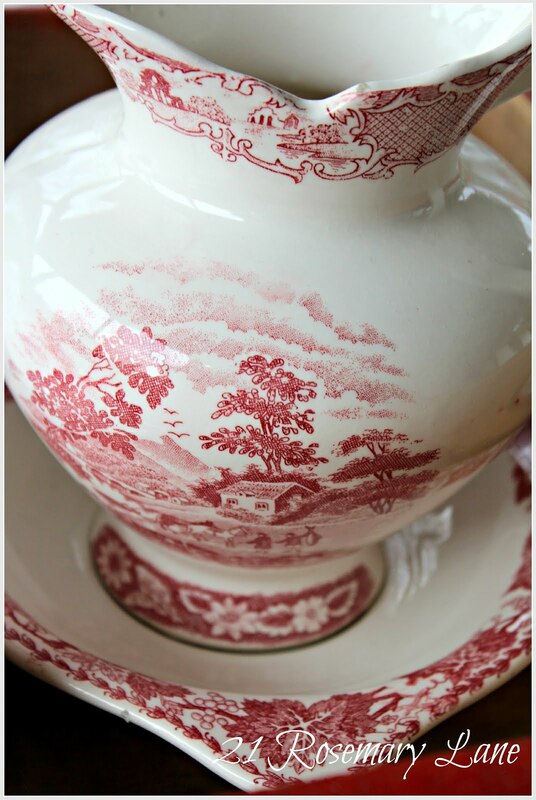 I have quite a large collection of red and white transferware including a set of dishes that we use everyday! I LOVE your blog...I have come back again and again to read bits and pieces. I appreciate the commitment to having an up to date post and many things of interest. I also love the colors!! A lot of blogs have jumped on the blah white and burlap band wagon....I really enjoy seeing your home with beautiful color.